Of interest to buyers of antique salvage materials is an antique shop in Sparow, 15 minutes away from Castle Fleesensee. There you can buy antique salvage and furniture from castles and manor houses. Salvage are items from old buildings that have been dismantled. The consist of anything from doors, windows, floors, lamps, mirrors, garden sculpture, fencing and much more. Shipping to US port will be taken care of you. If you like to stay in castles and a fan, then this tour is for you. Mecklenburg is a beutiful state in Northern Germany situated between Berlin and the Baltic Sea. 1700 km coast line with sandy beaches and steep cliffs, wooded hills, wide open countryside and thousands of lakes make Mecklenburg one of Germany´s most impressiv landscapes. More than 2000 castles, strongholds and manor-houses set in extensive gardens and parks add to the romance of the landscape. Furthermore you will visit Brandenburg with its many recreational lake region, medieval walled towns and historic villages and, of course, Berlin´s Germany´s dynamic capital where the tour starts. In Berlin you will stay two days in the 5* Grand Hotel Esplanade located in the Tiergarten, the green heart of Berlin between the famous Kurfuerstendamm, the glamour avenue which was once the heart of West Germany and the Brandenburg Gate at the start of the Unter den Linden Boulevard with its historic architecture and theaters. Day 2 - After arrival in Berlin transfer by City Guide Berlin to the Alexander Plaza or a similar hotel, where you will spend the next two days. The afternoon is at leisure to relax. In the evening dinner is in the Hotel Grand Esplanade. Day 3 – After breakfast our guide will pick up you at the hotel for a CITY OVERVIEW TOUR by private car. Enjoy an entertaining journey through the streets of Berlin covering the highlights of both East and West Berlin. Sights include the Tiergarten, Kanzleramt, Reichstag, Potsdamer Platz, Sony Center, Brandenurger Gate,Checkpoint Charly, the Berliner Dome, Gendarmenmarkt and much more. Day 4 – Today you receive your rental car to drive on the Autobahn to Goehren-Lebbin where you will stay three nights in the Schloss Fleesensee. The resort is set in charming landscape of lakes and woodlands where you will find relaxation and pleasure, and a a great variety of indoor and outdoor activities. The “ Bluecher Castle”, which was built in 1842 and is part of the resort combines traditional and history styles with classic modern architecture. After arrival you may want take part in a tour of the castle or take a leisurly walk at nearby Lake Fleesensee. If you like to play golf, you have the choice between one of the three 18- hole or two 9-hole golf courses. If you enjoy spa treatments then indulge yourself at the “Golden SPA”. INCLUDED: 9 – nights deluxe class accomodation 5* star hotels, daily breakfast, 5 dinners includes one glass of wine or bear or softdrink and one cup of coffee or tea, 2 lunches includes one softdrink, one cocktail in Harry´s Bar, one cocktail in hotel fleesensee, one 30 minutes long massage in castle Teschow, maps and driving information, all sightseeing and entrance fees as per itinerary and the services of City Guide Berlin. Upgrade to a suite on request. That’s right! You will fall in love with this small town – it is incredibly charming and captures its visitors. This is not surprising as it had long time to evolve – it is the oldest health and spa resort of the March Brandenburg. “Freienwalde – a nice name for a nice town” was Theodor Fontane’s opinion. But the town itself is much older; it was mentioned for the first time in 1316. However, it only found its destiny in 1684, when the gout suffering elector Frederick William tried the healing springs on the advice of his personal physician. 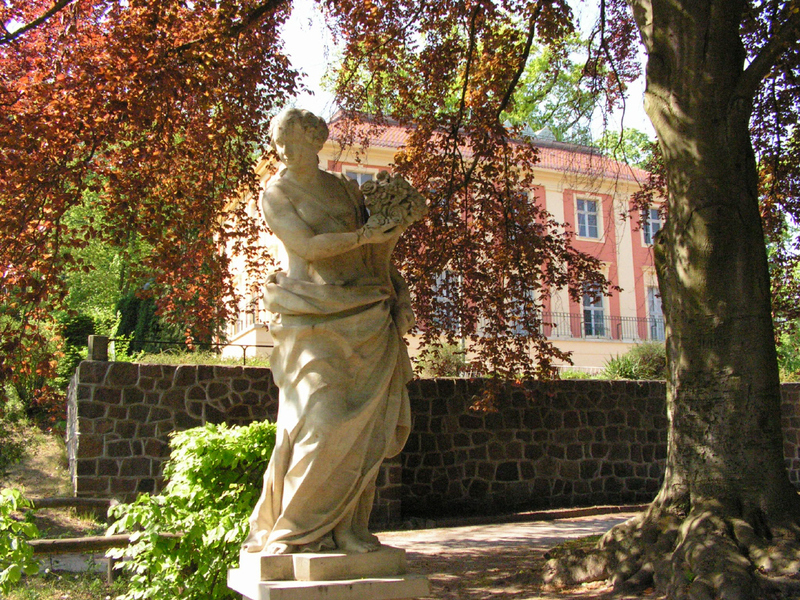 Convinced by its power, he piped the water and founded the Freienwalder Gesundbrunnen (Freienwalde Health Fountain). Since then Freienwalde has enjoyed steep career as a Health and Spa resort. Other great personalities became interested in the town: King Frederick William II instructed Carl Gotthard Langhans (the craetor of the Brandenburger Gate in Berlin) with building a royal residence and bathing house; the well-liked Prussian Queen Frederike Louise liked it so much that she had castle buílt and furnished to the plans of David Gilly and Peter Lenné designed a charming Spa Park. Of course such royal presence caused a lot of attraction, so that the town’s centre now boasts more than hundred building monuments of 18th and 19th century – Freienwalde became the Spa resort for Berlin’s celebrities. By the way: the elector’s springs at the moor bath still exist! One of the famous names who had his residence here, is the author and politician Walther Rathenau. He bought te castle in 1909 and lived there until his assassination in 1922. Since 1990 the town’s council has invested a lot of money to restore the health and spa resort to its former glory – and it has been worth it. The town probaly owes its charm from its unique location, the beautiful viwe of the wooded hillsides of the barnim to the width of the northern Oder marsh. “How often have I come this way. At Pentecos, when the trees were white flowers and at Chrismtmas, when they were white from the snow…” writes Fontane on one of his journeys to Freienwalde; he also enthused about Lake Baa, “the favourite of Freienwalde’s inhabitants”. This idyllic lake shrouded by legends is worth visit: you get there from the moor baths past the picturesque Brunnental, where you can see and admire natural monuments: a 44 metre tall ash tree and 50 meter high Douglas fire. There are many paths for hiking and walking in Bad Freienwalde. For example the moore bath hiking trail, the path trough the Arendskehle, the Siebenhügel (seven hills) path, which takes you past a 250 year old lime tree to Lake Baa, the Turmwander (tower hiking) path between tree towers and over 12 kilometers (wit the “tower-certificate” finally) and the Fontane hiking trail, which has been established in 1951 as the first nature traik of the former GDR. Every child in Germany recognises the black owle on yellow ground as a symbol of nature conversation. Did you know that the owls “father” is called Kurt Kretschmann and has lived until his death in 2006 in Freienwalde? Here, together with his wife erna, he created the house of nature conversation in 1960, with a two hectar large open garden, which still today is an attraction for numerous nature an garden enthusiasts. Also, the first nature conversation museum in Germany was opened by the Kretschmann’s in 1996; in 2004 was openend the new owl tower. All those who would rather explore nature by bicycle, there are plenty of opportunities in the bordering plains of the Oder marsh. No tourist or Spa visitor should fear boredom in Bad Freienwalde – on the contrary: if you want to take in all the attractions, you will have a lot to do. There is the castle, which Queen Fredericke of Prussia had built in the middle of a spacious park, the Foreign Minister of the Weimar Republic, Walther Rathenau, took over both in 1909 and lived there until his assassination in 1922. Next to it is the tea parlour, which house many events – again after the reconstruction in 2008. Bad Freienwald has a second park, the Spa park, which designed in 1826 by the famous garden designer Lenné: there you find the old manor lovigly restored to the kurhaus. A walk through the town is also rewarding: there is the St Nikolai church, the town´s oldest building, with a christening font dating from 13th century and the concert hall in the St George church, where you can experience concerts, exhibitions and talks in the foyer. The Oderland museum is in one of the nicest old townhouses of Bad Freienwalde, the “Freihaus von Loeben” is worth a visit. It houses interesting exhibitions on the history of the Oder marsh. Walks to te town’s five viewpoints are a particular delight – the views into the wide Oder region are rewarding. In the close surrounding areas there are many more attractive destinations: the Fontane house in Schiffmühle, where the Poet’s father lived until his death, the Brandenburg open air museum Altranft, which allows insights into the region economy and lifestyle and houses special events. Here you can also have a trip by horse drawn carriage. There are many more attractive destinations in the area: the ship canal lift in Niederfinow, the cloister Chorin with its summer concerts of well know orchestras and soloists, the ship museum in Oderberg, the former NVA (national folk army of the former GDR) air-raid shelter in Harnekop, the stork museum in rathsdorf and the Oder marsh zoo Altreetz. Not to forget the Albrecht Daniel Thaer monument in Möglin, which is dedicated to the man who renewed agriculture of the 18 th and the 19 th century in Prussia. The people of Bad Freienwalde know how to celebrate! There are many festivities troughout the whole year: the Köhler festival, the series “Classic in the park”, the Old Town Festival, the region’s winter sporting days. The Spa’s visitors shoukd be careful not to forget why they are here: to get better and not (only) to celebrate. Now we finally get to the most important: the reason why there is a “Bad” before Freienwalde: we get to the subject of health and spa resorts. If it was the natural healing springs which gave the town its reputation and attracted so many visitors during the time of the “great elector”, today it is especially the natural moor. In the specialist clinic and the moor baths Freienwalde, the orthopaedic clinic and the clinic for rheumatology, treatment is available in a variety of ways for in-patients. Post operative healing treatments are available, as well as in-patient medical rehabilitation. But also privately bad Freienwalde offers specific health programmes for preventative treatment. The lovingly restored kurhaus offers a diverse range of out-patient treatments. Also it is the right place for those, who just want to take some time out, a “wellness” holiday. There are many activities on offer for the active holiday maker: fitness, bowling. Tennis, canoeing, horse riding, cycling, swimming, walking and fishing – there is almost nothing that you cannot do. Also, did you know that Bad Freienwalde is most northern winter sport centre in Germany? Ther are now thre ski-jumpes (as from april 2008 there are a new 66-metres-ski-jumpes) – an attraction for for both athletes and tourists. To sum it up: Bad Freienwalde is just good for you. It does not matter how stressed or plagued you are: come to the oldest health resort in Brandenburg and you will leave it “alive and well”.